When is Universal App templates for VS 2013 VB.NET be avaiable? We can't comment on unreleased features. I updated my Visual Studio Express 2013 for Windows to Update 2 RC. I was disappointed to see that there is no universal app support for Visual Basic.Net. I was expecting there to be, because it's shown on the slide below. 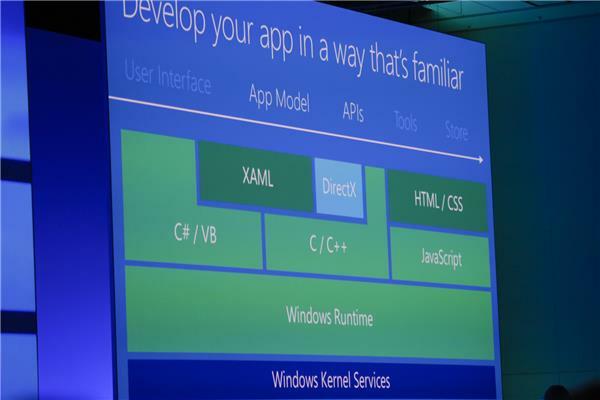 It is from the build keynote. Will it be in the final version of Update 2? I believe you should be able to, but it looks like the templates may not be available in the RC. I'm not on an upgraded system, but will double check when I am. This is an insult to VB devs. Not the lack of templates but the lack of explanation. Maybe MS should state the obvious and encourage all VB devs to move over to C#. Please make this template available as many developers are still using VB.NET and there are more than you expect. If possible then add it to online templates, so the VB.NET developers can start working for universal apps as they arrive in store. Relax. It was stated at Build that the universal apps support VB.net. Don't jump to conclusions based on templates being absent from a BETA release. You can't even submit these universal apps yet. VB.net is a 2nd class citizen. The documentation, etc. always lags behind C# a bit. Can you tell us, VB.net programmers, when the feature will be released? Sorry, but like Matt said: we can't comment on unreleased features. I completely understand that you cannot comment on unreleased features, but where will we be able to find out when the feature is released (where will they announce it)? When I first found out about Universal Apps in general, I realized that I did not have Visual Studio 2013 Update 2 RC (I only had Visual Studio 2013 Update 1). I am assuming that Visual Studio 2013 did not give me a notification of Update 2 RC because it is the RC version and not the final version, so does that mean that I will get a notification when the final version of Update 2 is released (I have Visual Studio 2013 set up to give me notifications)? I am a VB.NET developer, but if I had been a C# developer I would have wanted to know about (which I didn't) and get the RC version as soon as it was available so I could use the Universal Apps feature, so as a VB.NET developer I want to know about and get the final version as soon as it is available so I can use the Universal Apps with VB.NET (which, if I understood correctly, is expected to support VB.NET Universal Apps). I think what I am saying is I don't want to end up not finding out about it until 6 months after it is released. Thanks. VB Developers, do help to put in your vote. Wow talking about insults ! "VB.net is a 2nd class citizen" wow !! I have just installed the RTM version as promoted on the MSDN website , And i can tell you all that the VB.net Universall app templates are absent .. It is funny to see my e-mail boxes getting filled by your marketing department inviting me to start writing Universall apps or to rewrite my Windows Phone apps to Universall Apps .. So I was verry motivated to do so untill i found out that we were again ! not taken serious as Developers who prefer VB.Net , actually I just installed Eclipse and the Google SDK and in the time that I had reserved to rewrite my Apps to a Universall App I will now use that time to port my apps to Android and IOS wich i had planned for a later stage after completion of the Universall App and just hope you bring out the VB.Net templates ASAP. I have Always been a big promotor of Microsoft and Visual Basic .Net but this really dissapoints me :-( and i feel verry sad about this .. I recently installed Version 12.0.30501.00 Update 2 (the non-RC version), but still no VB.NET Universal App Template. I guess I can only hope that it is coming soon. You misunderstand me. VB.net is a 2nd class citizen because it lags behind C# (e.g. in the case of this thread), and is generally less widespread and accepted by users. Documentation lags behind C# (e.g. Windows Store code samples). I am a VB.net developer primarily. I like the language. But the reality is that it is not as widely accepted as C#, and if Microsoft has to prioritise between the two they must go with the most popular. Since this thread was started the final release of the Visual Studio update has come out and still the VB.net Universal templates are absent. That's not a good thing. You don't need the universal apps template to create universal apps. You can link existing apps in the stores, and you can create the apps separately while re-using the bulk of the code. I'm sure you'll get great support for VB.net from Eclipse /s. It makes little sense to port your apps to totally different platforms with different languages as an alternative to either linking VB apps or 'porting' to a C# universal app. You could create a universal Windows app in a fraction of the time, and then move on to your porting. Although I am again disappointed about the fact that it stays silent regarding this Mather, I still hope this is a big mistake and that MSFT is busy fixing this . I'm a software developer consultant and 90% percent of my customers use VB.NET. I've just installed VS 2013 Update 2 and there is no support for VB.NET in Universal Apps. This cannot be understood in any way. Please solve this question ASAP. Just install visual Studio 2014 CTP and it still does not have VB.NET Universal apps!